Interested in one of our services? Fill out the quick form to your right and we’ll be in touch very shortly. Additionally, you can email us and we’ll respond within 24 business hours. We Offer 10% Senior Discount! As time moves on the national standard for plumbing codes change, and mostly for good reasons. As JNR Plumbing LLC provides code compliant service and installations, we take the following information seriously and feel obligated to inform you of the following national plumbing code changes. First and foremost, the International Association of Plumbing and Mechanical Officials (IAPMO) has issued their concern of Legionella, how it is forming and precautions to prevent it from harming you and your loved ones. Below is a website address from the CDC to help make you aware of the issue. Control tampering by non-licensed, properly trained, or unfamiliar personnel, which can lead to scalding hot water temperatures. Below are the supporting reasons for such code changes. The legionella bacteria will grow in hot water tanks, hot tubs, large plumbing systems, cooling towers, and fountains. This can also be applied to any standing water as in our case, hot water heaters. This problem can be resolved by operating your water heater at higher temperatures such as 140 degrees. This temperature is much too hot for human skin and will cause serious burns when exposed to this temperature of water. The simple solution will be below. As we all may know, hot water heaters are controlled by other components or electronic devices. These devices fail. The most common failure in components is leading to overheating of the hot water. Since there are safety components to help the overheating of water but those temperatures are extreme. Temperature & pressure relief valves, hot water blow-off temperature is 210 degrees which is a boiling water temperature. Other devices are on shower valve units as some may call “hot stops”. As time goes by these pieces become cheaper in construction which leads us to leave a lot of trust in a small plastic part. In most cases after a repair, they get lost by falling in the wall, removed and never put back, of just thrown away because they are not known for their purpose. Control tampering has been a large issue lately. Some may have learned that the government stopped manufacturing of standard electric water heaters over 50 gallons in size. The latest trend has been to install the 50 gallon heaters in place of 75 or 80 gallon heaters, then jack up the temperature to accommodate the loss of capacity. OR, unqualified contractors selling the smaller sized water heaters just to win a jobs bid, then performing the same actions to compensate. When this tampering is involved, the customer is relying on one small piece of plastic (hot stop) to keep them or their children from getting burned. We are experiencing that some contractors have purposely been installing small heaters just win the jobs award. Some of these projects are VERY large and effecting many families. The energy efficiency portion comes when you raise your water heaters temperature. Instead of making the heater work to accommodate the drastic difference in water temperatures, a mixing valve takes part of that load, in turn using less hot water from the tank. The water gets mixed with the cold water at the mixing valve so this instance can make your utility bills slightly lower. It is not an astronomical difference but every little bit helps. As of January 2016, the national code council now advises all licensed plumbing contractors to follow the 2012 national plumbing code requirements. We understand that 2012 does not compensate this year, or the next following 3 years but it is our new guideline. There are many new codes within the observed standards but this one is the biggest requirement concerning you, JNR Plumbing’s client. Install a thermostatic mixing valve. This valve allows your heater to operate at the observed code temperature of 140 degrees. This temperature starts the killing process of bacteria, then this mixing valve adjusts your domestic hot water temperature to a code approved 120 degrees. 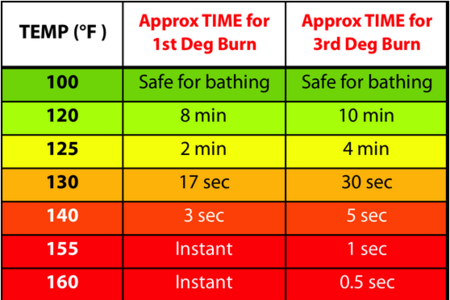 Please see our scald/burn chart below for more information. Please understand these are just estimated times. Please look over your water heater as most of them have scald charts printed on a sticker, on the water heater tank itself. For infants and elderly, a lower temperature maybe safer. 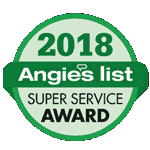 Our team of expert technicians provide the best plumbing, water heater, and natural gas services in Connecticut. We pride ourselves on offering a variety of services that best meet the unique needs of your property. We've seen all kinds of specialty plumbing fixtures. And, we've installed them too! Who better than a trained technician to clear your slow drains and to perform your sewer and drain cleaning. We have done it and we have been there, so we know how to get the job done. If you do not think of plumbers when you think of combustible fuels, let us change that. Book your service today, look over our available appointments, and pick a time frame that is convenient for you. Copyright © 2019 jnrplumbing.com. All Rights Rserved. Design by Fuel Rocket. SEO by Trenchless Marketing.